For some people callused feet is something they face every day. These calluses not only are unsightly, but often painful as well. For many people, pumice stones, grater like files or electric callus removers alone simply can’t rid them of their calluses. These people need to find the best callus remover gels and creams to help remove those calluses and leave their feet feeling softer and healthier. 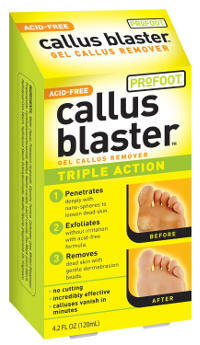 This Callus Remover bundle comes with both a callus eliminator and a dry heel eliminator by ProLinc. 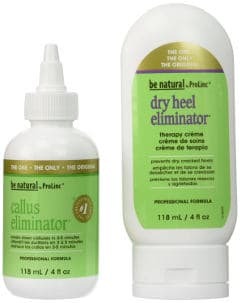 The callus eliminator is designed to break down calluses within 3 to 5 minutes of applying while the dry heel eliminator contains key vitamins and oil that can penetrate deep below the surface to hydrate your heels and help prevent further callus build up. This callus remover works best when applied either after soaking your feet or showering and left on for 3 to 5 minutes after which you use a pumice stone or other callus remover to remove the softened callus. You then rinse and spread on the dry heel eliminator to moisturize the area where you removed the calluses. Users find that this callus product works well and state that it almost liquefies the calluses. They also feel that it works on tough dry calluses and leaves their heels feeling healthy and looking great. 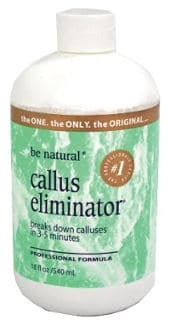 This ProLinc Callus Eliminator is the same product offer under the ¨Be Natural¨ callus eliminator name. It contains 18 fluid ounces and is designed to break down calluses in 3 to 5 minutes before filing or buffing this callus eliminator. ProLinc advises you not to apply this product to broken skin as it contains acid that can burn healthy skin. Users feel that this product works well even on the toughest calluses, softening them so that they are easy to remove with a rasp or a pumice stone. They also review that it allows them to remove calluses with little effort and say that it is good as any callus remover treatment you can get in a salon. 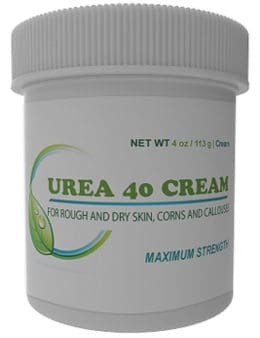 This Urea 40 Cream is a thin lotion like cream that comes in a 4 ounce container and is a pain free way to remove foot calluses. It comes with a money back guarantee. You simply rub this cream into your calluses or corns twice daily for the next 2 to 3 weeks and the calluses either fall off or are easy to remove. Users state that it works extremely well, resulting in much softer skin and really improving the texture of the skin on the heels. This is not only good for removing calluses, but corns and even KP bumps as well. This Profoot Callus Blaster comes in 4.2 ounces and is an acid free formula that exfoliates calluses away over time without causing irritation or any burning of healthy skin. It contains dermabrasion beads that help to remove tough dry callused skin. Consumers find that this gel callus remover works well over a period of time (usually 2 or 3 weeks). Some of them mention that you can speed up the removal of calluses by using a pumice stone after a few days which leaves your feet feeling smooth and looking healthy. This ZoomDry Callus Action Quick Gel is a 4 ounce easy to squeeze dispenser which is easy to apply. You simply leave this gel on your callus for 3 to 5 minutes after which you can easily file it off. This gel product has a no drip formula so it stays exactly where you put it. Users report that it removes tough dry callused skin quickly and easily by softening the calluses so that they can easily buff them away. It is easy to use and leaves their feet looking healthier than they ever imagined. They do suggest, though, that you either wear gloves when applying or wash your hands immediately after application. 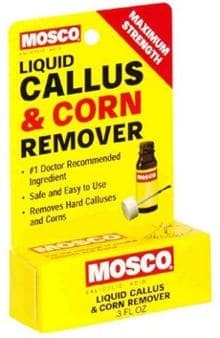 The Mosco Liquid callus and corn remover is only 0.3 ounces and comes with a brush applicator to make applying this liquid easier. It contains 17.6% Salicylic acid which is strong enough to remove calluses over time, without causing a lot of irritation. This product works best when put on the callus twice a day. You let the liquid dry and then the callus will either fall off or can easily be removed with a pumice stone or another callus remover. Users review that this product is effective at removing tough and painful calluses causing corns and calluses to be simple to peel off. While users do state that it does take some time to remove the calluses, they like the fact that it is gentle and leaves their feet looking and feeling healthier. 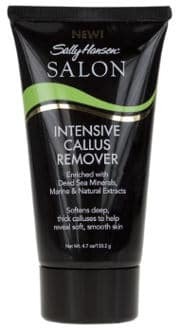 This Sally Hansen Salon Intensive Callus Remover comes in a 4.7 tube and is enriched with Dead Sea minerals as well as marine and natural extracts. By enriching this product with these minerals and natural extracts, it conditions your skin while removing the calluses. Users say that it works reasonably quickly and once the tough calluses are removed, this product can be used to keep new calluses from building up. To conclude, if you have tough to remove calluses and filing alone isn’t much help, then one of these best callus removing creams and gels can help you to get the results you want and need.